While running a relatively simple Informatica mapping I got the following error. Basically, errors like this means that something went terribly wrong and the Informatica server did not know how to handle it. In many cases you will need to contact Informatica support to help you with a solution. tnsnames.ora file used by the Oracle Client installed on the PowerCenter server machine gets corrupted. If this is the case, other workflows using the same tns entry would probably break as well. The solution is to recreate the tnsnames.ora file (or contact Oracle support). Message: [INFO] Created Java VM successfully. This led me to the conclusion that this problem is Java related. 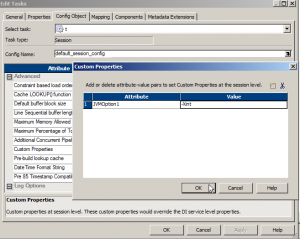 It is possible that the Oracle libraries/symbols are loaded first and there is a conflict of symbols between Java libraries and Oracle client libraries. The problem with setting environment variables is the fact that it is system wide change and there is always a risk of breaking something. So, changing a setting in the workflow or session level is always preferred. This way, if something breaks, the problem is contained. While looking for a workflow level solution I came across the following article suggesting that the problem is a result of mismatch between the Linux Java and the PowerCenter version. “This is an issue with the Oracle JDK 1.6 in combination with RHEL Linux. Java txn, and in turn the session is impacted. The JDK has a Just In Time (JIT) compiler component that works towards optimizing Java bytecode to underlying native assembly code. Assembly code is native and is faster than Java byte code. There are two solutions for the problem, one is, forcing the session (DTM) to spawn Java transformation with JDK 1.7 rather than JDK 1.6. There are details in the above link but, again, this is major change with many possible implications. 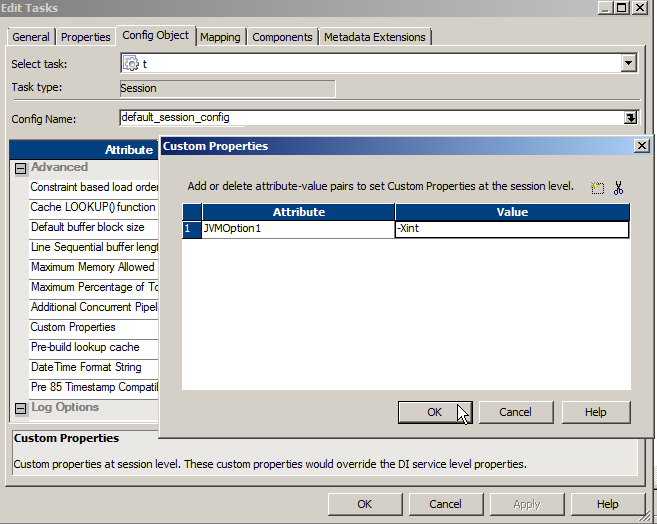 You can do this at a session level by adding the following JVM option as custom property to IS. It is important to understand that this means that there is no optimization performed on the Java transformation’s bytecode and a performance hit is expected in the Java transformation alone. Therefore, if the java transformation is performance sensitive, you might want to think about the first solution. This entry was posted in Uncategorized and tagged Informatica, Oracle on May 30, 2018 by Asaf Tal. Many times during the development process, there is a need to copy /export/backup table data between environments or stages. While it is easy to export the data using SQL inserts, it is also very easy to forget the sequences related to the tables. Sometimes, this practice results in DUP_VAL_ON_INDEX exception (ORA-00001) when you use NEXTVAL in your insert. The tables may already include high values but the sequence is lower than the max values in the table. Therefore it is important to remember to increment the sequences to a value higher than the max value in the table. 1)	alter the sequence increment to the difference between the current value of the sequence and the max value in the table. Another option of course is to drop the sequence and recreate it with the required value but this may invalidate objects referencing to it. Also, it will force you to re-apply all grants and permissions. Both above methods will work but not everyone have permissions to change the sequence. In addition, DDL operations are always risky. So, If you are looking for a short and sweet (or quick and dirty) way to increase the sequence value, look no further. This entry was posted in Oracle on June 15, 2017 by Asaf Tal.